Coach Dutch Warmerdam's team had reason to be confident heading into the season. The year before they had finished second at the NCAA College Division Championships in Chicago. What's more, the Bulldogs boasted world-class performers in sprinter Darel Newman and triple jumper/sprinter Charles Craig, and also could call on All-American hurdler and jumper Sid Nickolas. 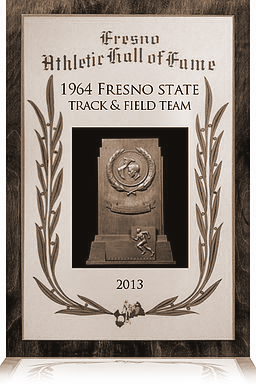 In addition, Fresno State was pegged to host the 1964 College Division Championships at Ratcliffe Stadium. Powered by Nickolas' victories in the long jump (26 feet) and 120-yard high hurdles (13.9 seconds), and third place in the triple jump, Newman's victory in the 100-yard dash, Craig's first place in the triple jump and a blistering, world-class performance from the victorious 440-yard relay team, the Bulldogs won the first NCAA team title in university history in any sport, scoring 87 points to outpace runner-up Long Beach State. A crowd of 4,000 cheered the Bulldogs on at Ratcliffe. According to the NCAA rules of the era, the top six individual placers at the College Division nationals could advance to the University Division Championships the following week. The Bulldogs were so talented they that finished third in the University Division at the University of Oregon, trailing the host Ducks and San Jose State. The 440 relay team placed second in 40.2 seconds. Such lofty performances were hardly surprising. Newman had tied the world record in the 100 at 9.2 seconds at the West Coast Relays earlier in the season, and Craig was the NCAA record-holder in the triple jump. Both qualified for the 1964 U.S. Olympic Trials.